Annie Bonneville is a Passionate blogger. She writes on behalf of ESTA . She loves to write as a guest blogger with interest in Travel and Automotive. One of the world’s top travel destinations, Malaysia is a tourist paradise. Malaysia is located in the southeast of Asia and is well known for its rapidly growing economy and rich biodiversity. The number of places worth visiting whist touring Malaysia is extensive, but here is a list of 7 places that are a must see for every tourist. This is a huge national park, Malaysia’s oldest, that was established in the 1930’s. A jungle in the middle of the Malay Peninsula, Taman Negara is home to diverse animal, bird, fish and plant species. You should expect to see the Malayan tiger, the Malayan tapir and the Sumatran rhino here. The park also houses Gunung Tahan, the highest point in the peninsular Malaysia, which makes it an excellent place for hiking, trekking and taking canopy walks. This national park, located in Kota, Kinabalu, is a world heritage site. It is also a sanctuary for exotic flowers, and wildlife such as the Malaysian Sun Bear. Mount Kinabalu which is located inside the park is one of the tallest mountains in Malaysia. It is slightly over 4,000 metres. On the contrary, this mountain is an easy climb for the hiking and climbing enthusiast. Other activities to do here include scuba diving, and snorkelling in the beaches of the Tunku Abdul Rahman National Park. This street in Melaka is famous for its nightlife, as it is lined with food stores and gift shops that are well-liked by tourists. The street is very busy during the day but livelier on weekend nights. Here, you should look forward to sampling some of Malaysian fine cuisine including laska and cendol. Melaka was awarded the UNESCO world heritage status as it is a cultural destination. When in the city, do check out the Cheng Hoon Teng Temple, the biggest Chinese temple in Malaysia, A Famosa, a Portuguese fortress built in 1511 and the Melaka Historical Museum. Kuala Lumpur has a bird park that boasts of over 200 bird species from all over the world, including flamingos and peacocks. 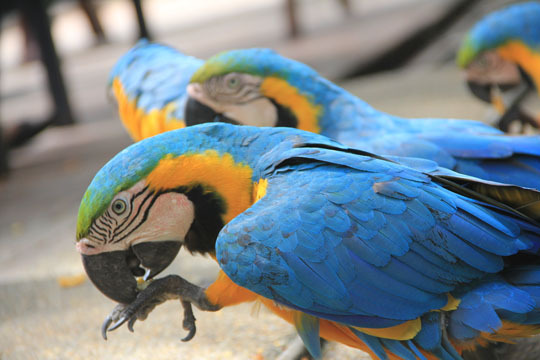 The tropical forest aviary which receives over two hundred thousand visitors annually also has an indoor bird display and a bird nursery. The bird park is adjacent to the Kuala Lumpur Butterfly Park that has over 5,000 butterflies, the Orchid and Hibiscus Gardens and the 15-metre Malaysian national monument. The capital city of Penang, Georgetown houses historical sites and temples. Some of the marvelous structures here include the Kek Lok Si, one of the most beautiful Buddhist temples in Malaysia, and Khoo Kongsi, an ornately decorated Chinese temple and clan house in Cannon Square. These are two islands famous for their spectacular beaches and water activities including swimming, diving and snorkeling. The Kinabatangan River in Sabah is renowned for its remarkable wildlife. Animal species in the river area include the oranga utan, the endangered proboscis monkey, Borneo river shark, pythons and Asian elephants. The river area also houses caves, swamps, mangrove forests and oxbow lakes. You can get there through a direct flight from Kota Kinabalu to Sandakan. Lovely post! Malaysia is one of my favourite place to travel. Simply- paradise on earth and the way you have described this stunning place I will travel to Malaysia very soon. I agree, Malaysia being a tourist paradise everyone must visit at least once in there life time! Pulau perhentian tu dari dulu lagi teringin betul nak pergi. Tnggu la nanti. A lot of nice place in our own country. There is no necessity to go for vacation outside Malaysia.